Coyote Blog » Blog Archive » Where Did the Mid-Range Jumper Go? "Begging the question" is a form of logical fallacy in which a statement or claim is assumed to be true without evidence other than the statement or claim itself. The mid range jumper has been in a gradual decline since the three point line was introduced to the NBA in the 79-80 season. All the great mid range shooters played before then, or at least learned to play before that time. But yeah, mathematically you're better off shooting a lower percent of 3's. This is a lot more complicated than the shot clock, as there are a lot of factors. In my mind, the biggest factor are the changes to defensive rules. With the removal of the illegal defense call, players can now guard space instead of only being able to guard other players. This has completely revolutionized the way NBA teams play defense, and now most teams are utilizing defenses that send an extra player at the ball while on the other side of the court their players utilize zone principles (This is the defense used by the Bulls and Celtics, but honestly most teams have some similar scheme in place). This more than counteracts the ban on hand checking players on the perimeter, and allows good defenses to wall off penetration into the sweet spots for those mid-range jump shots. The ripple effect of this has changed how the game is played down in the post. Lumbering centers are an endangered species in the league, as is an offense based on post play by the center. This is because these new defenses require centers and forwards who can play in space, as well as how the illegal defense change has allowed teams to better contain post based offense, since they can protect the back end of their defense with zone principles. The old "Inside-Out" mantra you sometimes hear commentators talk about is simply not the effective offense it used to be. It's far easier/better to attack the new breed of defenses by quickly moving the ball from the strong side of the court to the weak side of the court which can catch defenders moving to change assignments/recover. Finally, a big reason for the weight of the 3-point shot is that it is extremely efficient when made at the league average. MUCH more efficient than jump shots made from 15-22 feet out. And when you combine this efficiency with the spacing benefits of having good shooters on the floor who must be accounted for and it's no wonder that these shot charts look like they do. You Americans seem to have an awful lot of shootings in courts. Is it some thing about the right to bear arms? Or maybe an attempt to keep the judges honest. "Which begs the question, I suppose, as to why anyone shoots the mid-range jump shot at all"
Due to diminishing returns in a 2 player strategic game, you should only see excess shots from high point areas in proportion to how much more valuable they are. That is, if shot X is 9x more valuable than shot Y, you should still see 10% of shots from location Y. If you go to the well too often, you start to devalue your good shots and underutilized the returns from using your bad shots. This is kind of complex in a non-discrete game like basketball, so lets move to football. Your team is good at running and bad at passing. You decide to run every single down since that has a higher return based on a static analysis. Well, the other team isn't static. It's a strategic player and responds by putting 8 men in the box. You keep running. They put 9 men in the box. You keep running. They put 10 men in the box, then all 11 if you never pass. At that point, your runs are all going to be for -2 yards, and your passes will be fore 0, because you don't take any. This is because your opponent is responding to you but you are not responding to them. What you should do is craft a run/pass mix that has the same ratio as your run/pass payoff. If you are 9x better running, 10% of your plays should still be passes. There is some math that I don't have at my fingertips, but this has the nice effect, if you are playing against a smart opponent, of making all plays equally valuable. Also, if your opponent is smart, this optimizes your expected returns by inciting your opponent not to over commit to your bread and butter running plays. Things get more complicated if you break play-action out from pass plays, but the logic remains the same. Your run:pass:play action returns should dictate your run:pass:play action rates. Go back to a non-discrete basketball court, replace some algebra with calc, and you can see why there should still be some mid-range jumpers. I used to watch the NBA back when the 3-point line was first instituted. Very few of the players back then had practiced such long-range shooting. 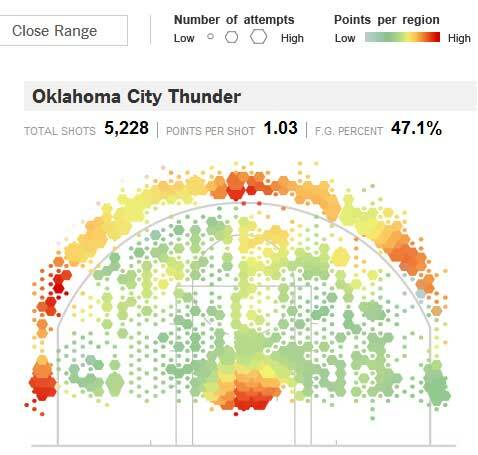 Pistol Pete Maravich, Larry Bird, World Be Free, and a few others could shoot well from that range. Now a couple of generations later, players have trained their whole live to hit 3-pointers. I don't watch NBA games any longer. The games are boring - one pass and a shot, or the ball is kicked out for a 3-pointer. I didn't watch the game, but I would suggest that the data is a reflection of defensive positioning rather than some type of disdain for a mid range jumper. Hah! Tjic nailed the gross abuse of BTQ before I could irritate our host with it.